Hey guys, another movie review is up, and this time it's the MMA flick, Unbeatable, starring Nick Cheung, Eddie Peng, and Crystal Lee. Thanks to Tune Talk, I got the chance to catch this movie at the premiere screening, and we even got treated to drinks and popcorn! How awesome is that? Synopsis: Unbeatable tells about a former boxing champ Fai (Nick Cheung) who is knee-deep in debt and with no solution in sight. To escape his debtors, Fai escapes to Macau and works in a gym as an assistant instructor in weight loss classes. Hot-blooded Qi (Eddie Peng) was once the son of a rich man in Mainland China. However, the family business failed, sending his dad into alcohol-fueled depressing and forcing Qi to take up construction jobs in Macau. To inspire his father to stand up again, Qi enters an open MMA competition and starts training at Fai’s gym. Verdict: 7/10. It wasn't THE best movie I've seen, but it's up there with the rest of the awesome movies that have been made this year. The chemistry between Nick and Eddie as sifu and pupil was amazing, and with Nick's witty comedic comments, the movie was made all the more enjoyable. I found myself having a good laugh at his one-liner quips, and loved the way he still managed to make a serious scene comedic without overdoing it. The character development was good, and there was enough background shown for each major cast that it made you understand where they came from and why they did what they did. Thanks again to Tune Talk for the Unbeatable movie screening passes. Tune Talk is the main sponsor for the upcoming ONE FC Championship in November and Malaysian Invasion Mixed Martial Arts (MIMMA). 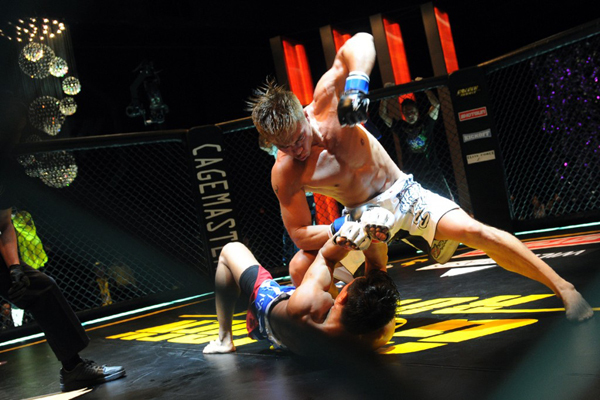 Get your calendars out as they will be announcing the second season of MIMMA soon and you will not want to miss it! !